Connor Baxter has won this weekend’s Maui 2 Molokai race in Hawaii, further extending the longest winning streak in the history of men’s SUP racing. This was Connor’s sixth straight Maui 2 Molokai crown, dating back to the inaugural event in 2010. With conditions on the famous downwind run milder than usual over the final five miles, Connor won in a time of 3 hours 13 minutes, nine minutes slower than his 2014 victory. Dark horse Australian Matt Nottage, a definite name to watch in the future, was runner-up after matching Connor for the first hour, while Brazil’s international star Vinnicius Martins took a very strong third place. Connor’s win cements his reputation as the world’s greatest ocean racer. The guy is close to unbeatable in Hawaii. In addition to six straight Maui 2 Molokai titles, Connor has won four straight OluKai crowns and three of the past four Molokai 2 Oahu showdowns. 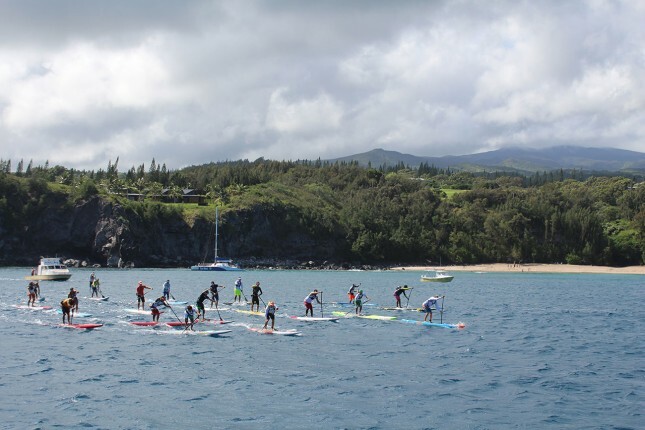 The “greatest winning streak in men’s SUP racing” began almost five years ago to the day, when Connor scored a surprise win in the 2010 Maui 2 Molokai race. 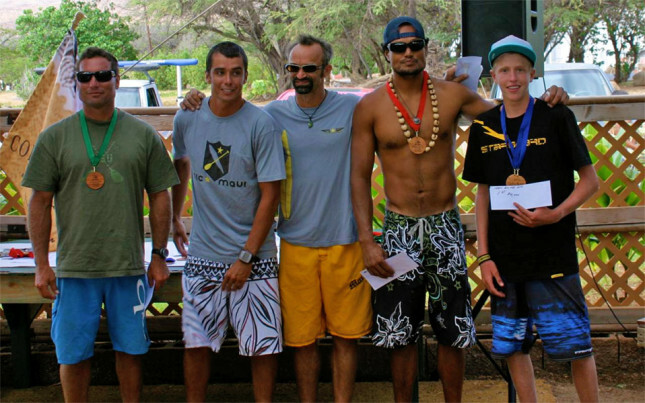 On that day, a skinny little 14 year old Connor defeated Ekolu and Dave Kalama, Livio Menelau and Mark Raaphorst to win the inaugural M2M title (see the archival photo down below). In the women’s M2M it was downwind queen Andrea Moller triumphing once again, with New Zealand’s Penelope Strickland runner-up and Lena Ribeiro from Brazil third. Interestingly, Andrea is the only stand up paddler who can claim a longer winning streak than Connor, having won her seventh straight OluKai title a couple of months ago. Though missing from today’s race was Andrea’s SIC team mate and downwind sparring partner, Sonni Honscheid. 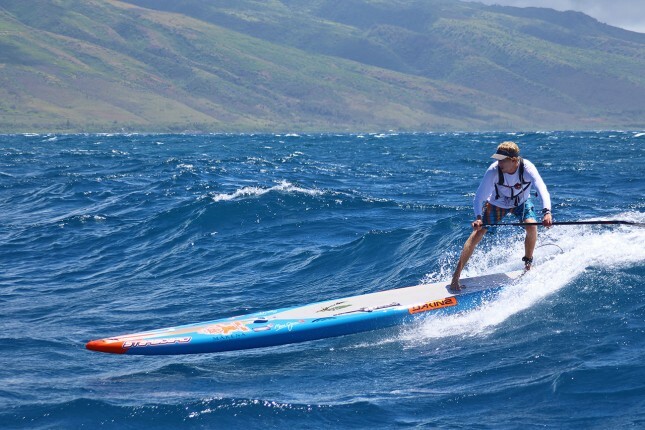 Sonni opted to sit out the 27 mile channel crossing and save her strength for next weekend’s big one, where she’ll look to defend her crown across the 32 mile “Channel of Bones” between Molokai and Oahu. Outside the men’s top three, today’s unlimited field also featured the likes of Lincoln Dews, Beau O’Brian, Jeremy Riggs, Vinnicius Martins, Mo Freitas and Josh Riccio, while Kody Kerbox, Armie Armstrong and Ethan Koopmans battled it out for a close 1-2-3 finish in the stock class (14′). Despite the big names, the level of competition at the 2015 Maui 2 Molokai race was slightly down on last year, with superstars Travis Grant and Kai Lenny, who both raced M2M in 2014, choosing to rest ahead of next week’s main event. Dave Kalama, who finished third in this race last year behind Connor and Kai, pulled out of both the M2M and M2O after constant travel disrupted his training schedule. 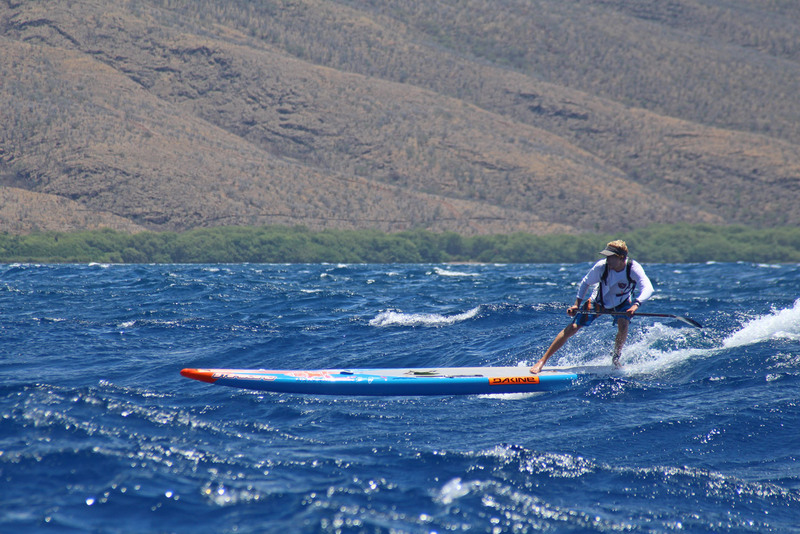 Last year’s M2M scored 26.5% on the Race Index, while this year’s Maui 2 Molokai came in at 21.5%. That won’t be enough to improve Connor’s overall world ranking points tally, as he’s already holding five very big results (and besides, the Starboard superstar can’t go any higher than world number one anyway), however we can expect a few other changes when the Men’s Top 100 Leaderboard gets updated on Monday afternoon. Look for runner-up Matt Nottage to make a big jump. My preliminary calculations see the Aussie dark horse rising 8 or 9 spots from his current position at world #34. Matt has been a virtual unknown outside Australia, though I don’t think that’ll last much longer. The youngster seems to get better and better with each race and has the potential to match it with the best in a year or two. Vinni Martins should jump a few positions as well, with the Brazilian set to move within one or two spots of the exclusive top 20 after claiming an excellent podium spot this weekend. The JP Australia team rider currently holds a world ranking of 24. Lahui Kai’s Lincoln Dews, who was carrying two orange donuts in his “five best results” points tally before this weekend, will also jump a few spots and should be safely back inside the top 20. Lincoln is the highest ranked paddler that’s carrying less than five results from the past 12 months. 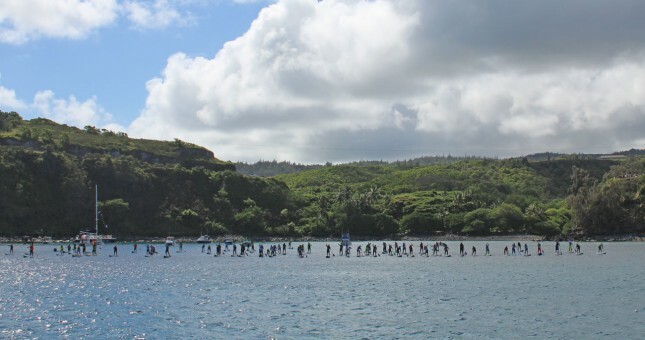 As with all the ocean races in Hawaii where unlimited boards dominate, Maui 2 Molokai is classified as a “line honours” race, meaning it doesn’t matter which board class you were in, your absolute position across the line is what determines your world ranking points. So if you finished 15th in the unlimited division but three stock guys beat you, you actually finished 18th and that’s what decides your world ranking points. The only exception is the 2- and 3- person teams, which don’t count for points (solo results only). Unfortunately the women’s M2M, which scored 21.0% on the Race Index in 2014, won’t count for points this year due to the relatively shallow depth of talent on the starting line. We’ll update the men’s World Rankings on Monday afternoon. View the updated World Rankings – Top 100 Leaderboard. Outside Maui 2 Molokai, the other big change to the rankings this week will be Kai Lenny dropping down one spot to world number three. Kai overtook Danny Ching following the Barcelona race three weeks ago, however his decision not to compete in this year’s M2M, and more importantly the removal of points from the 2014 SUP World Cup in Germany, will see him slip. Races are only held in the World Rankings system for 12 months in order to keep the leaderboard fresh and relevant. The SUP World Cup, which Kai finished runner-up in last year, was canceled this year and points from the 2014 edition are set to expire tomorrow. So despite neither Kai nor Danny actually racing this weekend, both their world ranking positions will change. Kai will have a shot at redemption next weekend though, with Molokai 2 Oahu expected to score very highly on the Race Index (my early calculations peg it at roughly 40.0%, which would make it one of the most competitive races of the year). If the Naish superstar wins M2O he’ll not only jump ahead of Danny, he’ll replace Connor as world number one. Thanks to Mike from Stand Up Magazin for the early reports (and the Insta shots below) – check out Mike’s updated recap of the race. Cheers to Beau O’Brian for giving us the full top 10 and Karen Baxter for the great start line and mid-channel shots.